Are you planning your trip? Ordering a taxi is easy with our app! Contact us. We will be very pleased to serve you. 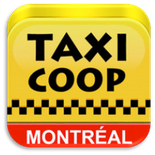 Taxi Coop Montreal, it’s also a mobile application. This application is fully integrated to our GPS dispatch system and allows you to order a taxi without delay. Our qualified drivers have been trained to leave you fully satisfied with their driving, and you will arrive at your destination quickly and safely. Taxi Coop Montreal is undoubtedly one of the most famous and valued taxi service among taxi users in Montreal. Our drivers respect our engagement in terms of car cleanliness, comfort and professionalism.